Skills vs. Competencies – What’s the Difference? Home » Skills vs. Competencies – What’s the Difference? Variety in writing is usually a good quality. Reading would become fairly boring if all writers used the same limited selection of words in every piece. Where should we draw the line between beneficial variety and pointless wordiness? This is probably a question for a style guide. Here, though, we can discuss the differences between specific words and decide which choice might be better. Skills and competencies are often used as synonyms. Are their meanings truly identical, or are there some situations where one might be preferable to the other? Continue reading for an explanation of these confusing words, their meanings, and whether either is the better choice for your writing. What is the Difference Between Skills and Competencies? 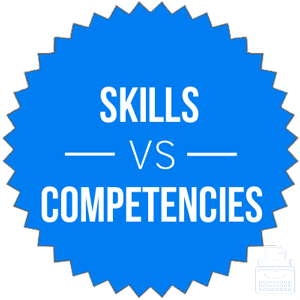 In this post, I will compare skills vs. competencies. I will use each word in at least one example sentence, so you can see how it appears in context. Plus, I will show you a helpful memory tool that will make choosing either skills or competencies for your own writing a simple task. What does skills mean? Skills is a plural noun. Skills are things that a person is good at doing. The singular form of the noun is skill. Skills are like talents. The main difference is that talents are generally considered natural abilities, while skills take more development and practice. A person might supplement natural talents with developed skills to become masterful at something. Shelby brings a plethora of skills to the table as our new CEO. You must build your skills as a Jedi Knight before you will be ready to face the Dark Side. What does competencies mean? Most people use competencies as a synonym for skills. In this usage, they are both plural nouns that mean things people are good at doing. The singular form of the word is competency. Many sources consider competencies a needless variant. The word skills is simple, more common, and means the same thing. Nevertheless, competencies has become widespread, especially in professional jargon. In these contexts, it usually means areas where a worker has been trained to organizational standards. At my performance review, my supervisor outlined several competencies for me to develop over the next six months. Management rolled out a new program to train all employees in the company’s core competencies. The singular form competency is useful in legal contexts, where it means the capacity to appear in court. It usually appears in the phrase competency to stand trial. Most of the time, you should choose skills over competencies, unless you are writing corporate-speak for a manager who demands it. Competencies vs. Skills Check: Since skills rhymes with thrills, always get your thrills by using skills instead of competencies. Is it competencies or skills? Skills is a plural noun that means things a person is good at doing. Competencies is a synonym, but many sources consider it unnecessary jargon. Its singular form competency has an important legal context. Still, choose skills most of the time in your own writing. Skills are things that people are good at doing. Competencies is a synonym, but many style guides advise against its use. 1 What is the Difference Between Skills and Competencies? Shoo in or Shoe in – Which is Correct? Smartphone or Smart phone – Which is Correct?